Rabbit Tobacco – Formally called Gnaphalium Obtusifolium, it is also known as Cherokee Tobacco, Indian Posey, Old Field Balsam, Sweet Everlasting, Cudweed, Poverty Weed, Fussy Gussy, and Sweet White Balsam. It grows most anywhere — in pastures, woodland, on prairies, and in thickets in the eastern states, east of Colorado. 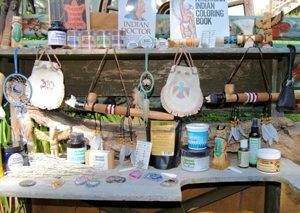 Utilizing the stem, leaves, and flowers, it has long been used for a variety of medicinal purposes by Native Americans including asthma, colds, cough, flu, pneumonia, bronchitis, diarrhea, as an insect repellant, sleep aide, and numerous other uses. It was often smoked in place of tobacco by both Native Americans and early settlers, and contains no nicotine. The smoke was thought to have held a spiritual or mystic power for many Indians. The Cheyenne often dropped the leaves on hot coals and the Cherokee were known to have used it in sweat baths. The Creek used it as a cold remedy, as a poultice applied to the throat for mumps, and as a sedative; the Koasati for fever; the Menominee for headache and a psychological aid when dried leaves were steamed as an inhalant for “foolishness.” Many tribes thought that the smoke had a restorative power that could revive the unconscious or paralyzed. When a poultice was made, it was used on bruises, and skin and mouth sores. The Cherokee also made a salve of the herb which they mixed with lard and rubbed on the chest to relieve congestion and induce sweating. Juice from the plant had a reputation as an aphrodisiac as well as an anti-venereal potion. In teas, it is said to induce sleep, help migraines, sinus troubles, cough, asthma, stomach problems, is a mild nerve sedative, and increase appetite. Ragleaf Bahia – Officially known as Bahia Dissecta, this flowering plant in the daisy family, is also commonly known as yellow ragweed or yellow ragleaf, it was also called Twisted Medicine by the Navajo tribe. 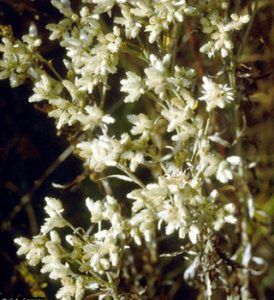 Native to the southwestern United States as far north as Wyoming, as well as northern Mexico, it was used in teas by several tribes as a contraceptive. Raspberry – Known by the biological names of Rubus Idaeus and Rosaceae, the leaves and fruits have a long tradition of use in pregnancy to strengthen and tone the uterine tissue, assisting contractions, and checking any hemorrhage during labor. As an astringent it is useful in a wide range of cases, including diarrhea, and to alleviate the problems of the mouth, such as mouth sores, bleeding gums and inflammation. As a gargle to help sore throats. Fresh or dried leaves were also steeped in tea for digestive complaints and mild nausea. Red Clover – Officially called Trifolium Pratense, this species of clover is native to Europe, Western Asia and northwest Africa, but, is planted and naturalized in many other regions. Traditionally, it has been used to treat cancer, whooping cough, respiratory problems, and skin inflammation, such as psoriasis and eczema; to “purify” the blood, improve circulation, and help cleanse the menopause and cardiovascular health. Rhodiola – Known officially as Rhodiola Rosea, it is also known as Golden Root, Roseroot, Aaron’s Rod. It grows in cold regions of the world, including the Rocky Mountains. It has long been used to improve mood and alleviate depression. It has also been found to improve physical and mental performance, reduce fatigue, stress, anxiety. Rooibos – Native to South Africa, Rooibos is technically called Aspalathus Linearis, and commonly known as Red Bush, though it is not red. It has long been used in teas to help with nervous tension, allergies, digestive problems, infant colic, asthma, heartburn, stomach ulcers, nausea, and skin conditions. Rose Hip – Also referred to as Rose Haw, it is officially known as Rosa Canina. There are more than 10,000 cultivated varieties of this fragrant rose plant which native of Europe and the Middle East. The rose hip is the fruit of the rose plant, that typically is red-to-orange, but ranges from dark purple to black in some species. Rose hips have long been used in foods as well as herbal remedies. Teas have been made to soothe cough, urinary tract problems, kidney issues, diarrhea, as an astringent, and to treat depressions, spasms, and inflammation. Rosemary – Technically known as Rosmarinus Officinalis, this fragrant herb of the Mint family, with needle-like leaves is native to the Mediterranean region. It has long been used for culinary purposes as well as medicinally, to improve memory, relieve muscle pain and spasm, stimulate hair growth, and support the circulatory and nervous systems. It is also believed to increase menstrual flow, act as an abortifacient, treat indigestion, improve immune system. It also may have anti-cancer properties, help the liver and in the treatment of viruses. 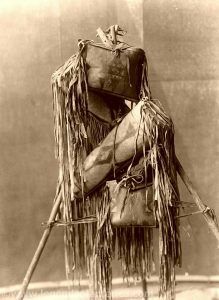 Native American Medicine bags, Edward S. Curtis 1910. Click for prints, downloads and products. Sage – Technically known as Salvia Officinalis, this small evergreen shrub is also known as garden sage and common sage. Sage is held sacred by many Native Americans because of it’s effective purifying energies. It heals by providing balance and cleanses the body and mind of negative spirits. People have been cooking with sage for thousands of years and like other culinary herbs, it has long been thought to be a digestive aid and appetite stimulant as well as a number of other medical conditions including flatulence, abdominal cramps, bloating, spasms, bleeding, diarrhea, colds and flu, cuts, bruises, irregular menstruation, tuberculosis, stomach ache, excessive perspiration, and to aide in childbirth. It has also been helpful in menstrual cramps, to stop breast-milk production, menopause symptoms, cough, throat infections, and dandruff. Saltbush – Officially known as Atriplex, there are several hundred species, also known as Orache. It includes many desert and seashore plants which are extremely tolerant of salt content in the ground. Their name derives from the fact that they retain salt in their leaves. Various species have long been used for a variety of health conditions, including pain, sores, spider and insect bites, rashes, stomach ache and more. It has also been used to purify water. The Hopi were known to burn and inhale the smoke for epilepsy and also used it in kiva fires for ceremonial medicine; the Paiute to boil the leave which they used for sore muscles and aches and a poultice was applied to the chest for colds. In addition to using for insect bites, the Navajo were known to have used the leaves for pain, cough, gastrointestinal problems, and as a toothache remedy. Sarsaparilla – Scientifically called Smilax Regelii and Smilax Aspera, this perennial trailing vine with prickly stems is native to Central America and is most commonly known for its use in soft drinks. It’s been used throughout the world for many centuries and in the 1400’s, it was introduced into European medicine by contact with the indigenous tribes in South America. It has several beneficial uses in medicinal remedies including treatment for syphilis, to aid digestion, pain, blood cleansing, arthritis, colds, impotence, gonorrhea, rheumatism, wounds, fever, cough, hypertension, skin diseases, leprosy, and cancer. Like many other herbs, it has anti-oxidant properties. The Penobscot were known to have used pulverized dried sarsaparilla roots in combination with Sweetflag as a cough remedy. Sassafras – Officially known as Sassafras Albidum, these small trees or shrubs native to the eastern North America From Maine to Ontario, south to Florida and Texas. Sassafras was used extensively for food and medicine by Native Americans long before European settlers arrived and its bark became one of the first exports of the New World. In early American folklore, explorers and settlers associated the pleasant aroma of the tree with healing and protection from evil influences, and extracts of the bark and roots soon became a panacea elixir sought by Europeans. Over the years, it has been used to treat measles, chicken pox, colds, flu, fever, as a blood purifier, and as a remedy. Savory – Known officially as Satureja, Savory is a genus of aromatic plants of the Mint family, related to rosemary and thyme. There are about 30 species called savories, going by several names including Mountain Savory, Summer Savory, and Winter Savory. Summer savory, which is more highly prized as a spice and as a folk medicine, has long been believed to act as an aphrodisiac. It also has a number of uses in medicinal remedies including aiding the system, and to treat flatulence, diarrhea, cough, and colic. Having warming effects it was also used on the chest for congestion. Saw Palmetto – Scientifically known as Serenoa Serrulata, this small palm grows throughout southeastern parts of North America, and its berries have long been prized by people as well as wildlife. Native Americans have been using saw palmettos for a wide range of purposes including food; the leaves used to weave baskets and and ceremonial dance fans. The heartwood of the palms have been used for traditional medicinal purposes as well as pounded into flour. It has been used in remedies for diarrhea, abdominal pain, to aid digestion, cough, respiratory congestion, inflammation, prostate health, sexual vigor, and to stimulate appetite. Schisandra – Officially known as Magnolia Vine, is a genus of shrub that has many medicinal uses. It is a tonic herb that aids in helping people recover after an illness, can improve mood, protect the liver, improve sexual function, to treat skin irritations, hepatitis, respiratory conditions, cough, fatigue, and is an antioxidant. Laboratory studies also indicate it can help blood pressure, brain efficiency, nervous system, increase endurance and build strength. Senna Leaves – Scientifically known as Arabic Sana, this is a large genus of flowering plants native throughout the tropics, with a small number of species reaching into temperate regions. It is known well as a laxative, and has been found to be helpful with the spleen, liver, anemia, typhoid, cholera,jaundice, gout, rheumatism, tumors, bronchitis, leprosy, dysentery, skin disorders, dyspepsia, and cough. Shavegrass – Formally known as Equisetum Arvense, is also known as Horsetail, as well as Scouring Rush and Bottle Brush. First recommended by the ancient physician, Galen, several cultures have employed Shavegrass as a folk remedy for kidney and bladder troubles, arthritis, bleeding ulcers,tuberculosis, to treat wounds, and stop bleeding, making it a popular treatment for nosebleeds and hemorrhoids. It has also been used to to treat urinary problems, the prostate gland, and to stop bed wetting. Skullcap – Officially called Scutellaria Lateriflora, this perennial herb in the mint family is native to North America and grows throughout Canada and the Northern United States. Also known as Blue Skullcap, Hoodwort, Virginian Skullcap, and Mad Dog, it was traditionally cultivated and used by Native American women for menstrual cycles, to stimulate the reproductive system. Some tribes used the herb in purification ceremonies. The Iroquois used an infusion of the root to keep the throat clear, while other tribes used some species as bitter tonics for the kidneys. It has also been found to relieve stress, support the nervous system, for insomnia, tension, and restlessness. A powerful medicinal herb, it is an anti-inflammatory, abortifacient, has been used as a sedative, for the treatment of epilepsy, hysteria, anxiety, throat infections, headache, pain, anxiety, convulsions, and more. Pregnant women should not take Skullcap. Slippery Elm – Technically called Ulmus Rubra, the Slippery Elm, is a species of elm native to eastern North America, from southeast North Dakota, east to southern Quebec, south to northernmost Florida, and west to eastern Texas. The tree had many traditional uses by Native Americans including using the inner bark fiber for thread, bow strings, ropes, clothing and more; the wood was used for numerous purposes, and the bark and leaves in washes and teas for medical purposes. Treatments included digestive disorders, gastrointestinal conditions, sore throats, ulcers, gout, arthritis, stomach ache, intestinal worms, cough, and bronchitis, and other respiratory irritations. Whole bark was also used as an abortifacient, but, sometimes had serious consequences, including the death of the mother. Washes were used to treat skin conditions, vaginitis, hemorrhoids, toothaches, and spider bites. Spearmint – Officially called Mentha Spicata, and also known as (Spear Mint or Spearmint) is a species of mint native to much of Europe and southwest Asia, Garden Mint, Menthol Mint, Mint, Sage Of Bethlehem, Silver Mint, and Spear Mint, it is native to Central Europe, but, is now naturalized throughout the U.S. and Canada. A medicinal herb tea made from the fresh or dried leaves has a very pleasant and refreshing taste, and has been used in the treatment of fever, bronchitis, chills, cramps, chronic gastritis, common cold, headache, indigestion, morning sickness, motion sickness, nasal congestion, nausea, and painful menstruation. Externally, it has been used for bruises, stiffness, muscle soreness and rheumatism. Spirulina – A type of blue-green algae that is rich in protein, vitamins, minerals, and antioxidant that boosts the immune system and helps protect against allergic reactions. It is also said to be effective for infection, liver, and certain types of cancer. Star Anise– Officially known as Illicium Verum, this is the fruit of a small tree that grows in Asia. Having a licorice-like flavor, it it used as a spice in cooking and also in medical remedies. It has been used to treat rheumatism, colic, flatulence, headache, nausea, vomiting, gastric distress, flu, cough, whooping cough, to stimulate the appetite, aid digestion, and increase the production of milk in new mothers. Some folk remedies recommend it to facilitate birth and to increase the libido, as well as to relieve menopausal discomforts. Star Grass – Formally known as Hypoxis, it has often been called African Star Grass and African Potato, as it is native to South Africa. Having several species, the roots have long been used by traditional healers in the treatment of urinary infections, heart weakness, internal tumors, and nervous disorders. One species in particular, Hypoxis Hemerocallidea, has been called a “wonder herb” and “miracle cure,” is said to alleviate many related ailments such as the common cold, flu, arthritis, tumors, and cancer. The Catawba tribe used a species in a tea for dysentery. Stevia – A genus of about 240 species of herbs and shrubs in the sunflower family, it is native to subtropical and tropical regions from western North America to South America. The species, Stevia Rebaudiana, commonly known as Sweetleaf and Sugarleaf, has long been used as a sweetener, as well as in treating heartburn, obesity, flatulence, diabetes, and hypertension. Stiff Goldenrod – Officially called Oligoneuron Rigidum, and also known as Prairie Goldenrod Rigid Goldenrod. The leaves and blossoms have been found to be an effective antiseptic, astringent and to stop bleeding. It has long been a valuable remedy in the treatment of all kinds of hemorrhages. Often the flowers were ground into a lotion and used by Native Americans to treat bee stings. St. John’s Wort – Officially known as Hypericum Perforatum, and also known as Tipton’s Weed, Chase-devil, or Klamath Weed, St. John’s Wort is most commonly used as an antidepressant. It has also been used to relieve muscle problems, to reduce swelling, sprains, cramps, bruises, varicose veins, menopausal symptoms, and anxiety. Stoneseed – Technically known as Lithospermum Officinale, this genus of plants belonging to the Boraginaceae family is also commonly known as Gromwell. The mature seeds have long been ground into a powder and used to treat bladder stones, arthritis, as a sedative. Many Native Americans, such as the Shoshoni, also used its roots as a contraceptive. A syrup made from a decoction of the root and stems was also used in the treatment of eruptive diseases such as smallpox, measles and itch. Sumac – Scientifically called Rhus Glabra, this shrub is native to North America found in all 48 mainland states of USA and in southern Canada. Also called Dwarf Sumac, Mountain Sumac, Scarlet Sumac, Smooth Sumac, Upland Sumac, White Shoemake, Vinegar-tree, and Red Sumac, it was used extensively by Native Americans for food and medicine. Young shoots, roots and fruit were eaten raw. The fruit was also cooked or tribes believed that Sumac could foretell the weather and the changing of the seasons, so it was held as a sacred plant. An infusion of the bark or roots was used as an antiseptic, astringent, diuretic, and for the treatment of colds, diarrhea, fever, to increase the flow of breast milk, sore mouths and throats, and inflammation of the bladder and painful urination. An infusion of the leaves was used for asthma, diarrhea, and stomach aches. A poultice of the leaves and berries was used to treat skin rashes, burns, poison ivy, and skin eruptions. The powdered bark was often made into an antiseptic salve and the leaves were chewed for sore gums and rubbed on sore lips. The berries have been chewed as a remedy for bed-wetting. An infusion of the blossoms used as an eye wash for sore eyes. The milky latex from the plant is used as a salve on sores. Mild decoctions from the bark was also used as a gargle for sore throats. It has also been found to be useful in the treatment of late-onset diabetes, constipation, painful or difficult menstruation, and may have possible applications in the treatment of tuberculosis and some cancers. Sweetflag – Officially known as Acorus Calamus, this plant, native to Southern Asia, is has long since been introduced to most parts of the world. Also called Calamus, Sweet Sedge and Myrtle Flag, it has a very long history of medicinal use in many herbal traditions. The root has been used to treat flatulence, colds, cough, heart disease, bowel problems, colic, cholera, menstrual problems, dropsy, headache, sore throat, spasms, toothache, and swelling. It has also been used externally to treat skin eruptions, rheumatic pain, and arthritis. Some Native American tribes considered the root a panacea; others thought it had mystic powers. Didn’t they use medical marijuana in some form? Doing research on a project, any input would be appreciated.